• Select your type of fabric and sewing technique and the Exclusive SEWING ADVISOR® feature instantly sets the machine for you. 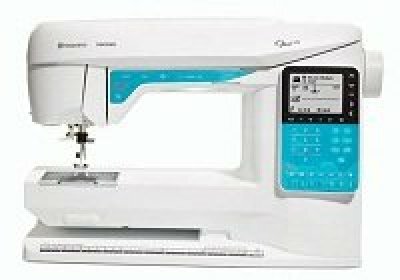 It automatically sets the best stitch, stitch width, stitch length, and sewing speed. The selected stitch is displayed with the recommended thread tension, presser foot, needle size and type, and presser foot pressure on the Graphic Display. • 29 Needle Positions for exact needle positioning. Sews a straight stitch in 29 different needle positions for perfect top stitching, edge stitching, under stitching, stitching-in-the-ditch, or quilting.